Christmas is certainly a great time to spend with family. If your elderly or disabled relatives find it difficult to get around your bathroom, we’ve got some quick and easy ways to adapt it to their needs. Here at VictoriaPlum.com, we believe that everyone should be able to enjoy a stylish and affordable bathroom. 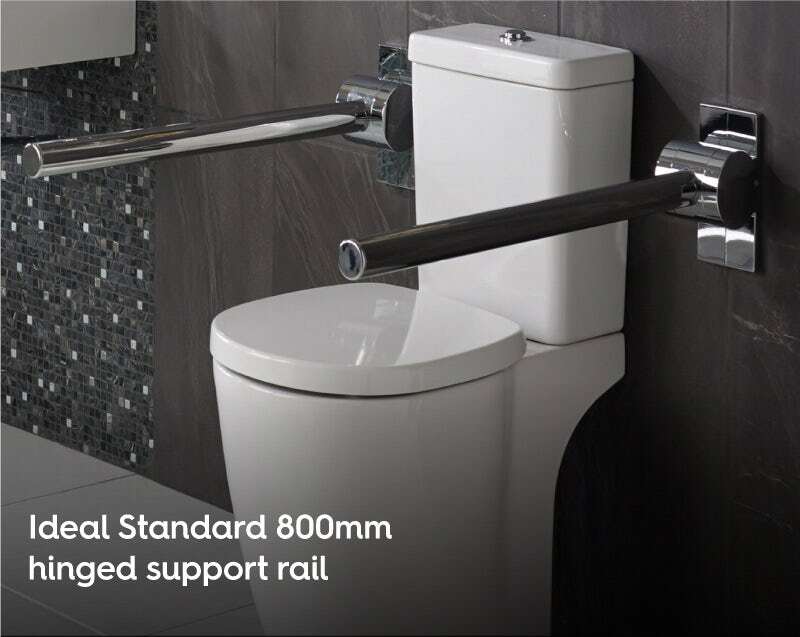 As part of our Independent Living of accessible bathrooms, you’ll discover a wide selection of products which will help you create an inclusive bathroom which empowers those with mobility issues, whether that’s through a disability or old age. 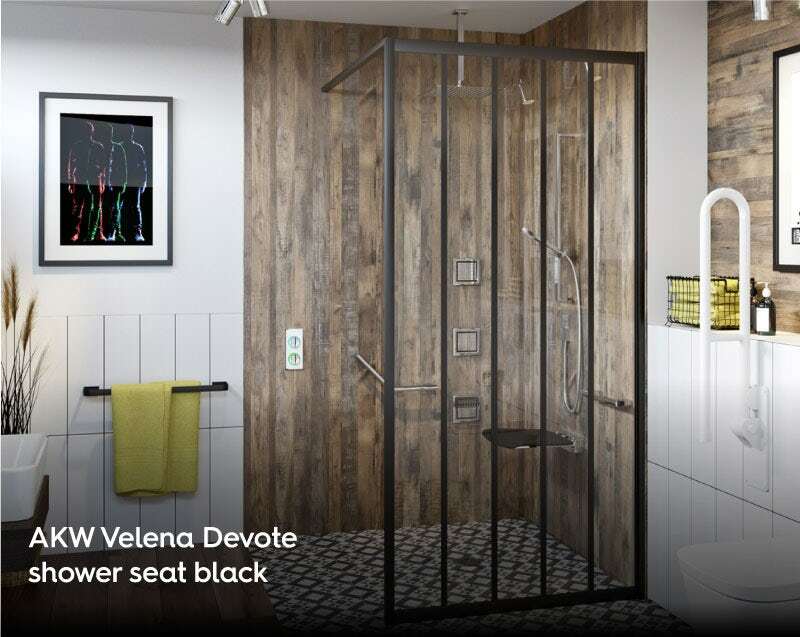 In this post, we’ll be looking at some simple ways you can adapt your bathroom to help elderly or disabled house guests, whilst maintaining a stylish and functional family bathroom that everyone can enjoy. 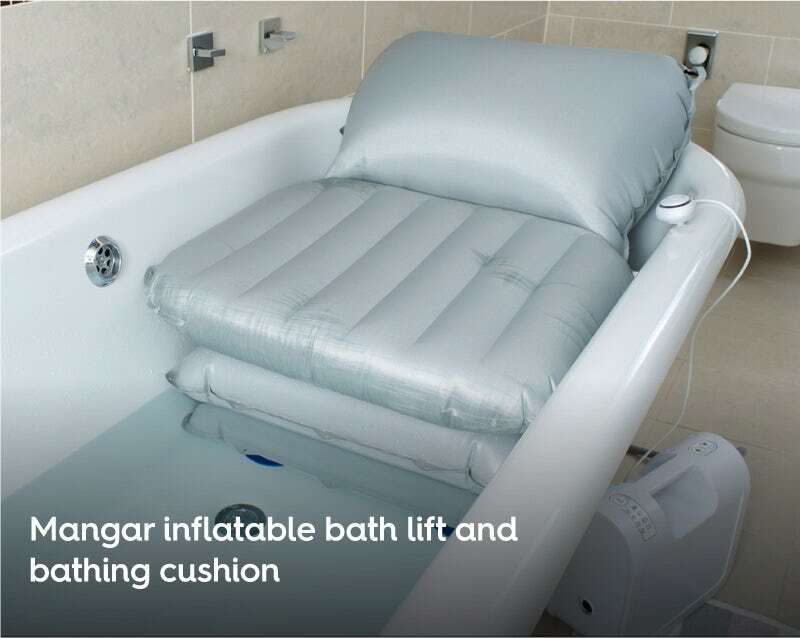 Ideal for anyone who finds it difficult getting in and out of the bath, the Mangar inflatable bath lift and bathing cushion is the easy way to adapt a simple straight bath for comfortable entry and exit. This innovative and lightweight product is designed to inflate using a battery-operated pump, allowing the user to sit gently on the soft, air-filled cushion. The cushion then slowly deflates, lowering the user into the bath. The backrest can even remain inflated for added comfort. Once the time comes to get out, it can be reinflated, raising the user to the height of the bath edge, meaning no climbing is required, significantly reducing the risk of trips or falls. The great thing about this product is that it requires no major changes to your bathroom. The cushion attachs securely to bath with suction cups and the whole thing can be removed or fitted in a matter of seconds, so you and your family can use the bath as normal. The cushion is operated via a fully waterproof remote control and there is no risk of getting stuck in the bath, as the cushion will only deflate if it has enough power to reinflate. A simple solution to a common issue. A grab rail will help provide added reassurance for elderly relatives who have mobility issues and can be vital for those with disabilities. It may be a simple case of adding a rail to the wall adjacent to your bath, for help getting in and out, or perhaps next to your shower. However, to help ease themselves onto the toilet, you may need a larger grab rail for your house guest. A fold up grab rail could be the perfect solution, especially if you're looking for a more unobtrusive measure. The AKW Onyx range and Ideal Standard Concept Freedom collection both feature grab rails which look stylish and simply fold up when not in use. If you want to take things a step further, you could replace your current toilet with a comfort height toilet. Featuring a slightly higher pan and seat, a relative with a mobility issue may find it easier to sit and get back up off this type of toilet. For those with mobility issues, standing for a shower may be a bit of a struggle. So why not allow them to take the weight off their feet with a shower seat? There are 2 options you could choose. If you're adapting for a short term house guest, it may be an idea to invest in a freestanding shower seat, like those available from AKW Medicare. However, if your guest is staying longer or more frequently, it could pay to have a fold down seat installed. The great thing is, there are plenty of stylish designs to choose from which will complement your décor. When not in use, they simply fold back up and remain out of the way. 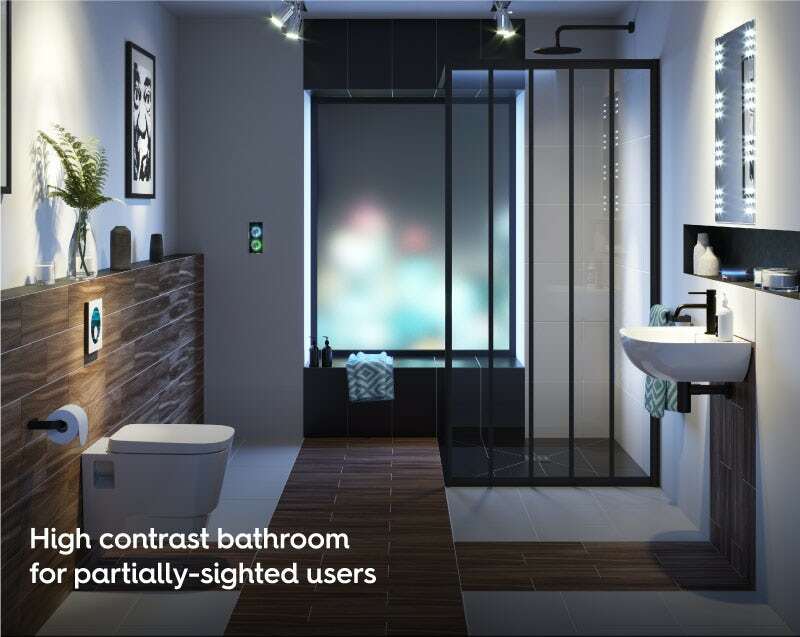 For those who are partially sighted, it will certainly help if your taps and shower are high in contrast to the rest of our bathroom décor. If your basin and walls are white, why not replace common chrome taps with black taps instead? You can also do this with showers and even accessories, helping your guest to locate them more easily. You’ll find a range of special finish taps, showers and accessories as part of our Spencer collection. For a more permanent solution, you could also add a SmarTap smart showering system which can be voice-activated when used with smart home systems like Amazon Alexa and Google Home. A toilet cistern with motion sensor flush also reduces the need to twist and turn. Shop our full range of Independent Living bathrooms today. If you’ve come across the term “Independent Living” for the first time, and are feeling a little confused about what it means, help is at hand. Creating a wheelchair accessible bathroom isn’t as difficult as you may think. In this blog post, we’ll demonstrate some quick fixes which can help adapt your existing space to wheelchair use.